OK, we hear you. We’ve heard that many times before, but hear us out. The first reason is safety. Commercial kitchens are very dangerous places, and one of the most dangerous parts of commercial kitchens is the grease filter. The filters act within your kitchen exhaust system to reduce the amount of vaporized grease that ends up within your exhaust system ducts. When grease gets trapped in your commercial kitchen’s exhaust system ducts, a flash fire can result. 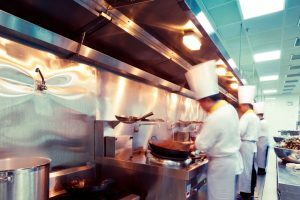 It’s incredibly dangerous for your staff, and it can cause restaurants and hotel kitchens to lose lots of money in terms of lost revenue during repairs. Clean filters can trap up to 70-80% of the grease that passes through them, but if your commercial kitchen’s factors are absolutely saturated with grease, they can’t do their job properly. As a result, your commercial kitchen will have a inefficient exhaust system and a dangerous accumulation of grease accumulation right above your cooking appliances – which is right where your kitchen staff stands the majority of the time. Dramatically reduce your risk of fire and increase in the efficiency of your commercial kitchen exhaust system by signing up for regular grease filter exchange service, as well as our regular exhaust system cleaning services. Your commercial kitchen will be safe and clean for your staff to work in and your customers to benefit from every day. Sign up for grease filter exchange service as well as commercial kitchen exhaust system cleaning and you’ll soon begin enjoying the benefits of our convenient, affordable services. Let us make life easier (and safer!) for you. Take the hassle out of maintaining your grease filter and exhaust system – enlist the experts at Flue Steam to take care of it instead. You’ll be so glad you did. We’ve been partnering with commercial kitchen managers throughout Southern California for over 48 years, and we look forward to helping you take care of these essential tasks without a single worry. Simply call 800-700-FLUE or email contact@fluesteam.com to initiate the service. We’ll set up a regular schedule for you. At regular intervals, a qualified technician from Flue Steam will deliver fresh, clean filters right to your kitchen at the preset intervals of your choice. Not only that – our technician will also install the new filters for you and haul away the old filters for cleaning.